Have you stopped thinking for a moment and just been fully present? Not so much stop thinking- we can never really do that as far as I am concerned- but stop thinking about other stuff than what is currently in front of you? 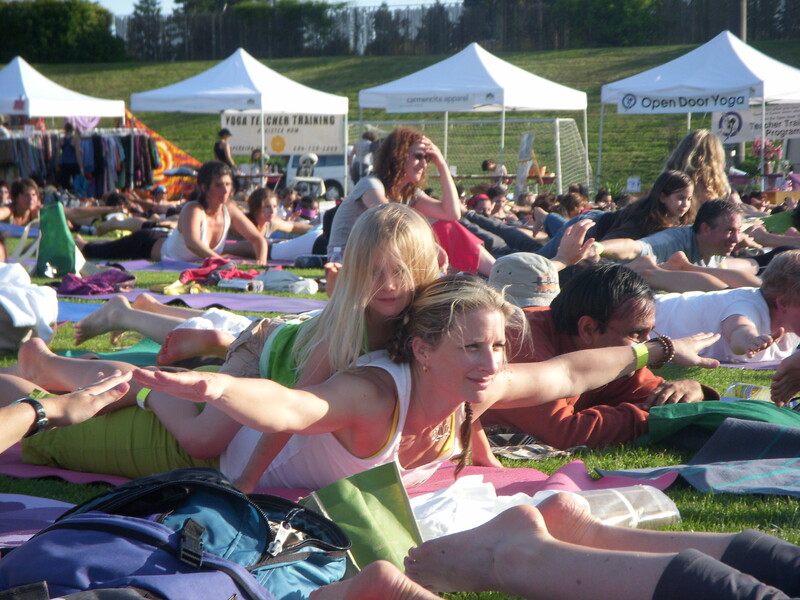 We had the most beautiful weekend here in Vancouver and it was such a blessing because it was the Annual Vancouver Camp Moomba Yogathon and Blissfest – and last year it rained so hard that we were surfing on our mats rather than standing on them. This year was the complete opposite- it was sunny, hot, and there was a gorgeous ocean breeze. 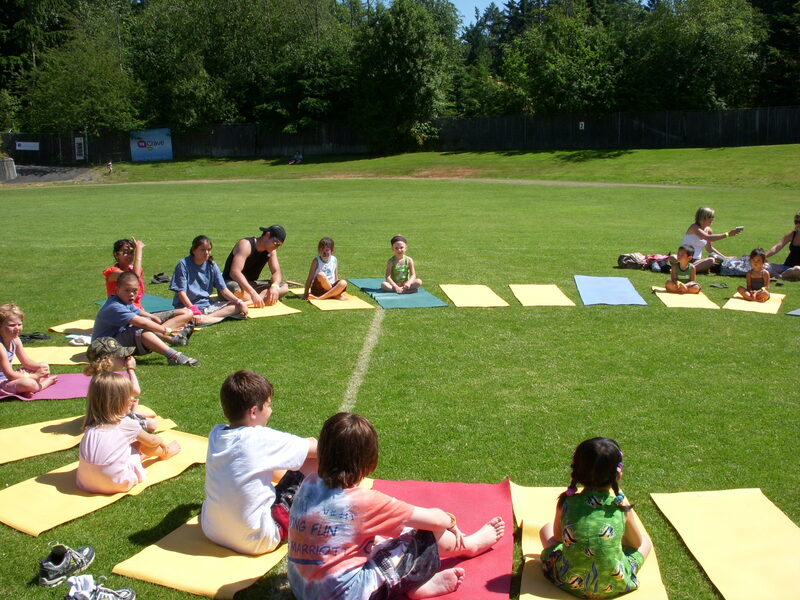 Thunderbird stadium’s grass field was dotted with colourful mats and people from all methods of yoga chatted and hugged in the brightness of the day. 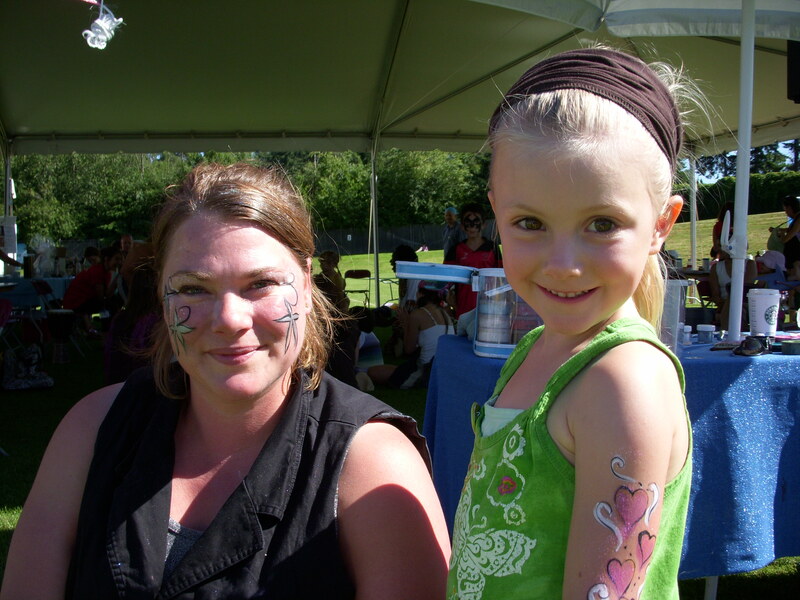 My daughter Madelyn was eagerly dragging me towards the children’s tent for face painting and kids yoga and I was delayed every step by an old friend, a student, a former teacher. Maddy was tugging on my arm and her voice was taking on the “Maaa-om, come on. LET”S GO!” lilt. I picked her up and said, “This is a special day- remember how it rained last year and it was cold- this year is beautiful and sunny. Let’s just stand here and look for a moment”. We looked at how many colours of mats there were- we tried to count how many booths and tents were set up. We listened to the music on stage and rocked with it’s rythum. We felt the sun on our skin and we looked at the blueness of the sky. We smelled the ocean in the air. We listened to the voices and laughter around us. I guess at age 4 almost 5 you maybe already live fully in the moment and don’t need to be reminded. I mean really – my kids can remember details of things and days that I have completely forgotten. Maybe too I am seeing life speed past at an alarming rate. When you are young we can’t wait to get older- when we are older we just want life to slow down. I look at my children and I see the passage of time. 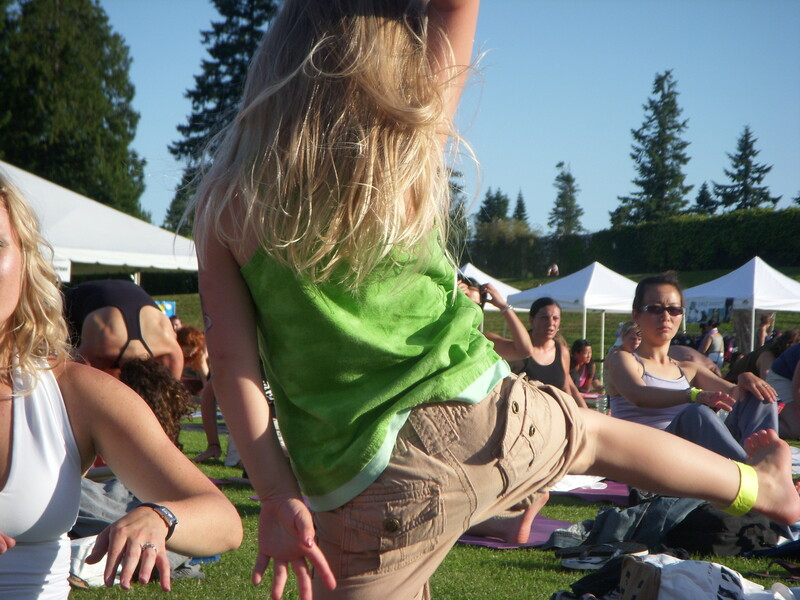 I have pictures of Madelyn from three yogathons now: age 2, 3 and 4. 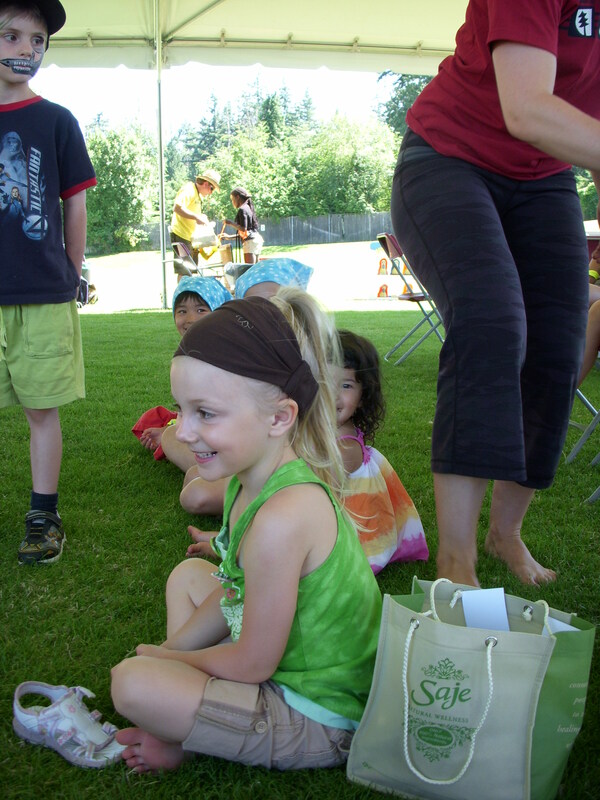 She has grown into this long-legged, blond, whirling dervish who steals the show. I know she is my own daughter , but she really is a sight to behold. I watched her concentrate in kids yoga and then look over to me to check to see if she was doing it right. I would give her a thumbs up and her whole face would beam in pleasure. She was having a day full of bliss and I was just as happy to watch her experience it. I looked at her hair against the sunlight, the hint of freckles on her nose, the way her new hairband matched the gold in her eyes. I hugged her against me tight when she was done and smelled her hair and felt her sun warmed skin. For a moment my throat filled with a lump and I thought of all the times that I was too busy doing this or that to read her a story or sit and play tea party with her. How many moments have I let slip away? Maybe I can’t hold on to all of them but I can be fully present for this one. We spent the whole day playing and visiting and finally it was time for the main yogathon- 108 minutes of all types of yoga- laughter, yin, vinyasa, sivananda, iyengar, anusara, yoga nidra- just to name a few. Exhausted, over heated and slightly bored- Maddy wiggled around on her mat and did a pose and then collapsed and sighed- then started to whine she is thirsty- then needs to go pee. I look at her and rather than get frustrated I just help her become more comfortable- get her some water- take her to the bathroom and try to encourage rather than scold. I am rewarded at the end when she climbs into my lap to meditate. She closes her eyes,crosses her legs and takes a very delicate chin mudra. 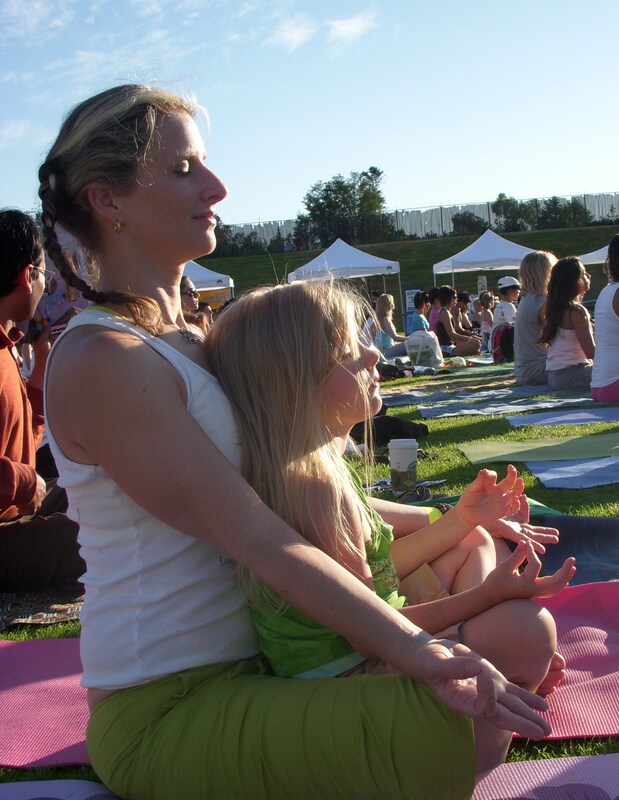 I feel her breath, her warmth, I feel the sun on my face and the love of my community all around us and I thank yoga for showing me the preciousness of the moment. beautiful spirits – both of you! everytime I look at Madelyn I get triple joy – one joy for her Madelyn spirit and one joy for the memories she brings me of my little Boo and one joy that she was made from two people I love very much. I love your writing and your pics AND it’s time to POST again, Girl. I feel like I know you just a bit through your insights and of course through Christina … I hope we meet some day.